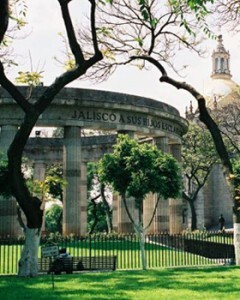 To discover our city is a wonderful experience, full of surprises and unexpected situations because when you turn around in some corner you will find something amazing Guadalajara is full of many important monuments and buildings and recognized, such as the rotunda of the illustrious men, resting place of the children of Jalisco that marked his place in history. At the same time in the center there are many other places representative of the city. The stories narrated in these places are special because they mark an urban legend in our city. 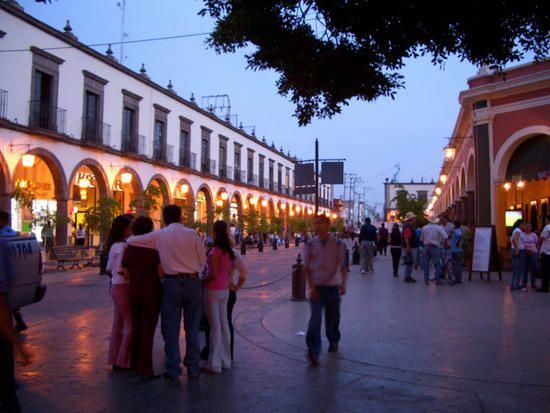 In Guadalajara, you can not only visit monuments you can find the daily lives of its inhabitants who will welcome you with warmth in their lives and you can socialize. Also the night life Guadalajara is a more than respectable, the nightlife in the city of Guadalajara is enviable, there are places for everyone. The balloon flight in Jalisco begins very early in the morning. You will meet first with managers to guide your experience and they will explain in detail your adventure. Once you know what you do, Get ready to fly through the air! At the end of your flight, it will take place the traditional toast to celebrate with those who have flown for the first time and also for the success of the balloon ride. You also enjoy a Mexican-style breakfast and a special tour in a traditional tequila Amatitlan, where they will show you everything about the production of tequila. The balloon flight in Jalisco is an experience to fall in love with this beautiful state! Fly air balloon over the Valley region in Amatitán, Jalisco. 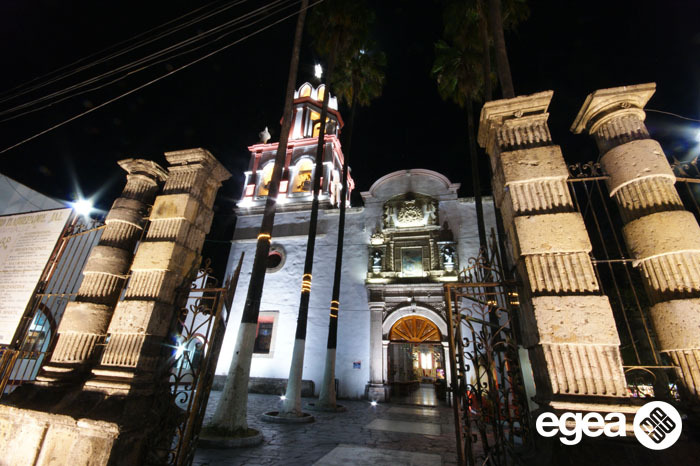 See the towns this incredible area as Tequila Jalisco, El Arenal, Tala or Teuchitlán. Amatitán Nahuatl meaning “grove of fig trees” gives you the opportunity to explore from the air and watch one of the municipalities producing state’s largest tequila. 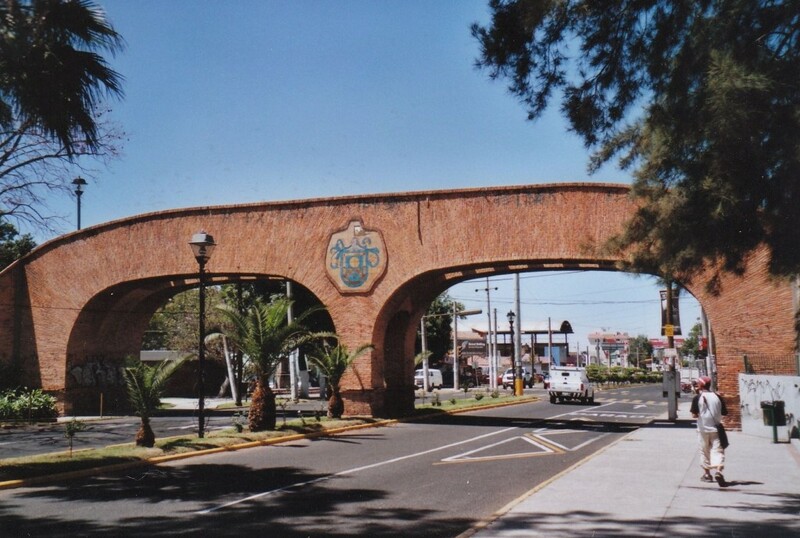 We will see from the short ride the towns of Amatitan, Tequila, and the Pyramid Site called Guachimontones. Our jurney starts by reserving with GDL Tours at gusmelor@gdltours.com our exclusive transportation will pick you up early in the morning with a hot pot of fresh coffee. Once on the site we go on board the hot air balloon with a qualified pilot to start our lift off. We can help you make your next corporate event an experience that your employees and co-workers will never forget! Why settle for the same, old company party when you could do something as spectacular as chartering a hot air balloon? If you are looking for a unique alternative to the annual company meeting, or need a refreshing twist for your corporate event or convention, then contact GDL tours DMC at +52 (33) 1578 0421 to arrange for a Corporate Balloon Ride Charter! A hot air balloon ride will make any corporate event more memorable! In 1848, the Belén Cemetery (also known as the Santa Paula Cemetery) was established next to the Old Civil Hospital in what was then the San Miguel Belén Orchard. The address is 684 Belén St. 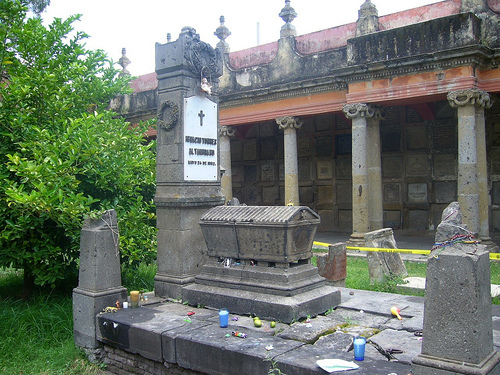 The design of this cemetery was charged to the architects Manuel Gómez Ibarra upon to the request of the Bishop Diego de Aranda y Carpinteiro. Hhe was the same architect who rebuilt the Cathedral’s towers after an earthquake had destroyed the original ones. 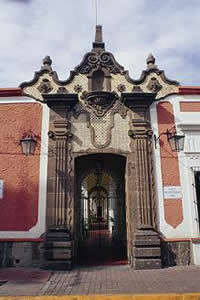 H e also built the dome of the city’s Cabañas Cultural Institute. The Belén Cemetery only functioned during 50 years, at which time, in 1986, it was closed by order of the health authorities. Since then, it has become a sort of museum piece, capturing the 19th century, pre-revolutionary period within its thick walls. The cemetery design is neo-classic with the romantic influence of that century. The main doorway walls are of red quarrystone; overhead a grand arch with a high relief representation of two little boys crying. Back of them is an urn over which represent this passing of time. The mausoleum has 900 niches. The columns are made of carved pink stone and ionic finishes. 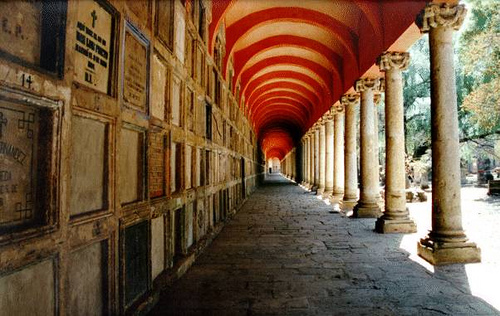 The main cemetery is full of tombstones of all sizes and styles covering baroque, neo-classic, romantic and neo-gothic. Larges trees provide shade. In the central portion, there is a chapel dedicated to the state’s outstanding men honored for their contribution to science, the arts, law and religion. Even though the cemetery no longer functions on a normal basis, it is open to visitors Monday to Sunday to 9 a.m. to 3 p.m. It has become the custom silent corner of this graveryard, perhaps as a symbol of the constant regeneration of new life. Agave is an old Greek word that refered to a goddess of fertility. Today this word is used to name a family of plants. In Mexico the goddess of fertility was named Mayahuel, the godess of the 400 breasts. 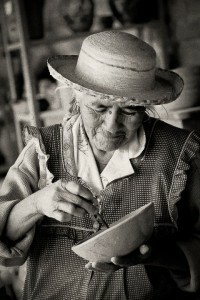 She was known as the god of the pulque. 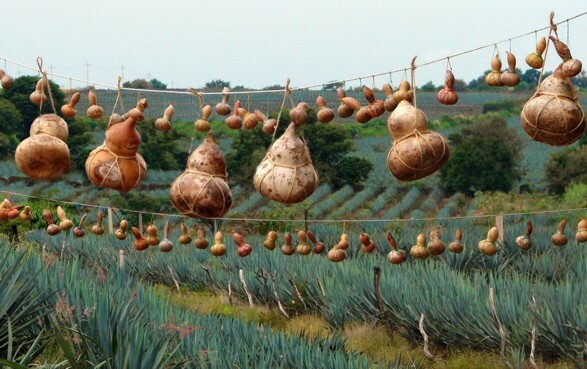 There are over two hundred species of agaves but only four of them are recognized to been able to produce alcohol. Out of them four only one is known to make tequila. The name of this agave plant is name Tequilana Weber Agave blue. Blue because when you see it from a few feet apart it looks like its blue. What it makes it appear blue is this cape that is on the stalks of the plant. This cape also helps the plant to protect it from the sun rays, and the plague. It was named Weber because in the 1910s a scientist named France Webber came to our country and named the plant after his name. Before the plant was renamed it was known as Mayahuel “pulque goddess”, she remains most strongly associated with the plant as the source, rather than pulque as the end product. The agave is a unique plant. What it makes it so special is the years it takes to grow and mature. It takes 12 years for this plant to grow. The older Agaves reproduce tillers, after two years of the tillers age they get replant. After they get replant we have to wait another 10 years to be able to cook and get at least one drop of alcohol. Is a really long time we have to wait, but it is worth the effort. When the plant is ready to be jimada (harvested) the jimador cuts all the stalks of leaving just the heart of the plant. The heart of the plant looks like a pine apple. When the harvest has enough pine apples ready for a load they load up the truck and transport them to the distillery for the cooking process. Once they get to the distillery the pines get cut in half before the workers place them inside the ovens. Each oven holds up to 22 tons of pines, and cooks them in a period time of 12 to 14 hours. Then the pines after been cooked are submitted to the squeezing process. Here at this process is where the machine squeezes all the goods out of the pine. The goods are taken to a stain steel container. Each container is capable to hold up to 30,000 liters. When the liquid is inside the containers we now have to wait 36 hours to be able to move on the next step. The next step is distillation. At the distillation the alcohol is obtained and the water separate. The liquid is placed in to the alambiques in a temperature of 90 to 110. We go through the distillation process two times. Among the reason we do it two times is because on the first time we only get 20 to 25 % of alcohol, and on the second distillation we obtain 50 to 55% alcohol. It takes a really long time to produce tequila and that is why I think we should learn to appreciate the value of the tequila. We need to know the proper way of drinking it, and the different kinds of tequilas. If you are interested in learning more about this fascitating subject and looking into the secrets of how the flavors are obtained, I am more than happy to prepare a special visit to one of the 120 tequila distilleries in this area. 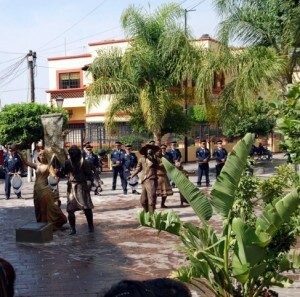 Living Sculptures Tlaquepaque Nutters or Contemporary Art? Works by contemporary artists have been exhibited from The American Center Paris, France, to the Museum of Modern Art, New York USA. The Favelas of Barcelona offer this show as well. This mobile art, I should say, Inmobile art, the sculptures will be in Tlaquepaque down town along pedestrian street on Friday 3 December from 16:30 hrs – 20:30 hrs. 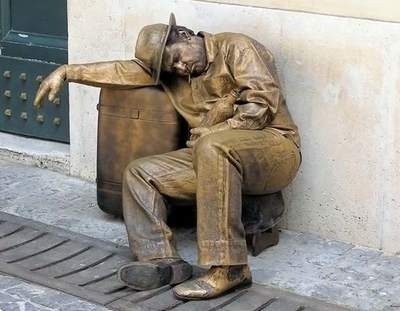 In its artistic expression bears the sun, cold, fatigue, hunger and other vagaries of life for 4 hours. Through this body art a variety of feelings are transmitted. With their costumes, gestures and position of their bodies express tenderness and cruelty, love and hate, peace or violence. Although beauty is really in the eyes of the viewer. . Ourselves we will be exploring our intimate corners, like admiring a reflection of us in the mirror. 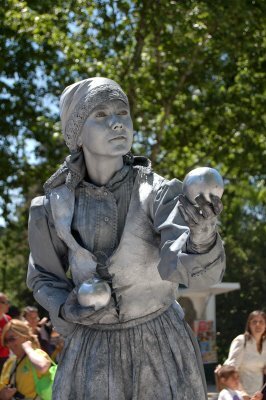 The peasant of the picture gives us apples with tenderness and sympathy, whereas the sleeping man presents us with some irony, the bittersweet taste of life. Both though very different in their expressions, pretend that our view is as nice in our journey through the world. Their effort will be appreciated by passers of Tlaquepaque, at least one of them will be outside the GDL Tours office, Independencia 329, so tips and your cooperation for these artists is needed, pampering them is needed to they continue to transmit this contemporary art. Think about it dear reader, it is not easy and it is very challenge to stay in one position for so long. Mezcala Island is near the town of Mezcala, on the northern shore of Lake Chapala, about an hour from Guadalajara, Mexico. From 1812 to 1816, a small band of Mexican rebels on the island held off the Spanish army and navy against overwhelming odds. Tired of the humiliation, the Spanish finally negotiated a peaceful surrender with the insurgents. Later the island served as a Spanish prison for many years. There is a Ceremonial precinct where indigenous structures and hieroglyphics existed on the island before the fortifications were built, there are still traces remaining. Now the ruins are being catalogued and restored by the Mexican National Institute of Anthropology and History. Tours of the island can begin from Guadalajara with gdltours Your guide will drive you to Chapala and take a small boat to the Mezcala Island. The tour of the island itself takes about an hour once the boat launch brings you to the island’s shore. Be sure to wear good shoes for walking through the ruins and rubble. Your guide will share with you a few intriguing secrets about this island that regular travelers never see or overlook. On the way back from the island, you can enjoy the fresh breezes and feel the heat evaporate from your body. The tour to Mezcala is at least five hours long and to recuperate from the heat and the sun your gdl Tour Guide will recommend a cold beer.